A few months ago, I wrote a blog post explaining how to create Wufoo Form Facebook Tabs. The process involved creating your own Facebook application and took approximately 15 minutes to complete. Since that post, I have found a much easier way to complete the exact same task. Obviously I would love to keep my latest method a secret, and make a little money off it – yet I am a huge fan of offering free resources to people who read my posts. Now let’s jump right into this extremely simple process (this might take 5 minutes of your time). This next step is simple – install the app by visiting this link, and make sure to click on “add to my page” (It’s located underneath the monthly active users). Instead of creating a custom Facebook app, we are going to let Static HTML: iframe tabs do the work. You should see a new tab on your page labeled “Welcome”. Click, then paste the code. It’s that easy! Make sure you click on “Save and View Tab” to preview how your tab will look! Note: I suggest checking the “no scrollbars” box – It’s much cleaner. Wasn’t that easy? If you would like to add additional Wufoo forms to your page, click on the FAQ & Help Center on the Static HTML: iframe tabs (it’s the yellow bar). If you would like to change the tab name, click on “edit page“, then proceed to “apps“. 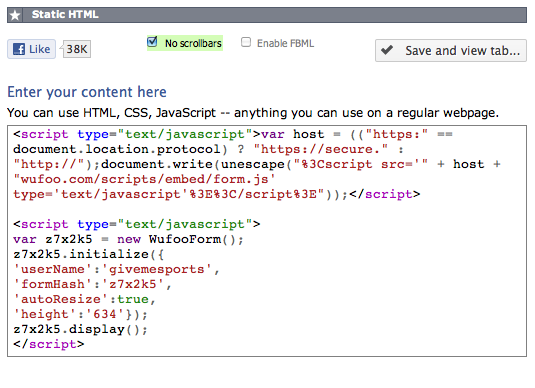 Click on “edit settings” for the Static HTML: iframe tabs, and change the name. If you want to change the “icon” on the tab, hover over it, and then click on the pencil icon. The screen (shown below) should appear, and then simply upload a different image. You’re done! If you have enjoyed this article, please share it with friends and colleagues. Also, please share feedback in the comments below! Enjoy!